New Year Brings New Trails! King County Parks has been hard at work in 2016, and next year, you’ll begin to see the fruits of our work, which you made possible through the voter-approved 2014-2019 Parks, Trails, and Open Space Replacement Levy. 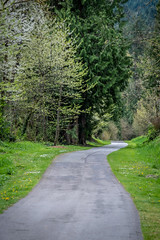 Lake to Sound Segment B will open – This 1.5 miles of trail along Des Moines Memorial Drive from S 156th St to S Normandy Rd comes within blocks of Burien’s walkable downtown center. Stay tuned for a February ribbon cutting! Green to Cedar Rivers Trail design starts – We will begin the design phase this spring for this long-anticipated trail, specifically for the 3-mile-long north segment, which goes from the Cedar River Trail south to SE Kent Kangley Road. We’ll be collecting information from community members and other stakeholders early in 2017. Breaking ground on the East Lake Sammamish Trail Segment A – The South Sammamish A trail segment, which goes from SE 43rd Way to SE 33rd St, is currently closed for construction and will be for the majority of 2017 as our construction contractor begins the process of paving this essential segment of the trail. Only one more segment left (segment B is currently under design) for this amazing trail to be completed in full! Let’s hear it for the Eastside Rail Corridor trail project – This incredible trail of more than 16 miles has already seen some amazing community and business partner support, and in 2017, we will start removing rails and preparing an interim trail for public use. Are you an avid Regional Trails System visitor? Do you see King County’s Regional Trails System for what it is – an incredible community asset to be invested in for future generations? Want to lend your knowledge and expertise to getting the word out? Become a volunteer Trails Ambassador! Being a Parks & Trails Ambassador means you take your volunteering to a whole new level, committing to serve 100 hours per year at a specific site. We’re always looking for new ambassadors that love the trails like we do! Visit our Parks & Trails Ambassador page to learn more.